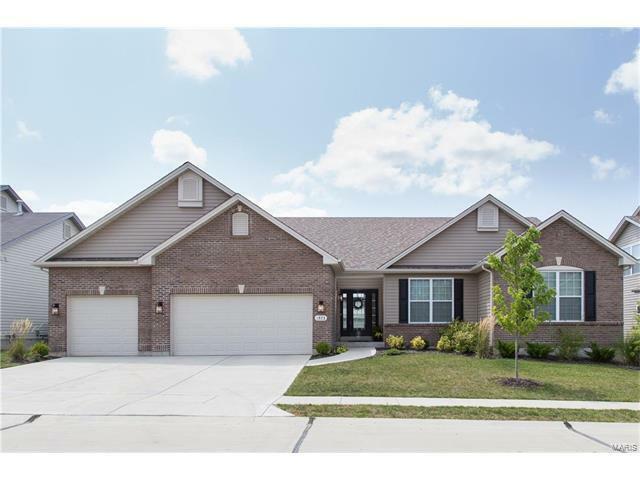 Beautiful, light filled, open floor plan ranch in popular Willowbrooke subdivision. McKelvey Homes built with 3 car gar and loaded with upgrades. You’ll love the soaring 12 ft ceilings in the great room, dining room, kitchen and breakfast room. Create gourmet meals and hang out in the chef’s kitchen, complete with huge granite center island/breakfast bar, granite counters, SS appliances and W/I pantry. Bring the party outdoors for dinner or BBQ on the large, easy maintenance deck. Your new master suite offers a lux bath with garden tub and glass enclosed shower. Split bedroom floorplan includes an alcove that serves as office/den or kids play/study area. Expansive, W/O LL has 9 ft pour foundation, rough in for bath and awaits your custom finish. Space will accommodate a large rec room, bedroom with egress window, bath and still have lots or room left for storage. This home is conveniently located and close to shopping, restaurants, major highways and is adjacent to the JCC complex. Schuetz Rd south of Page or just west of Lindbergh and JCC campus to north on Willowbrooke access road. Beckham Ridge Ct is the 1st street at the circle.